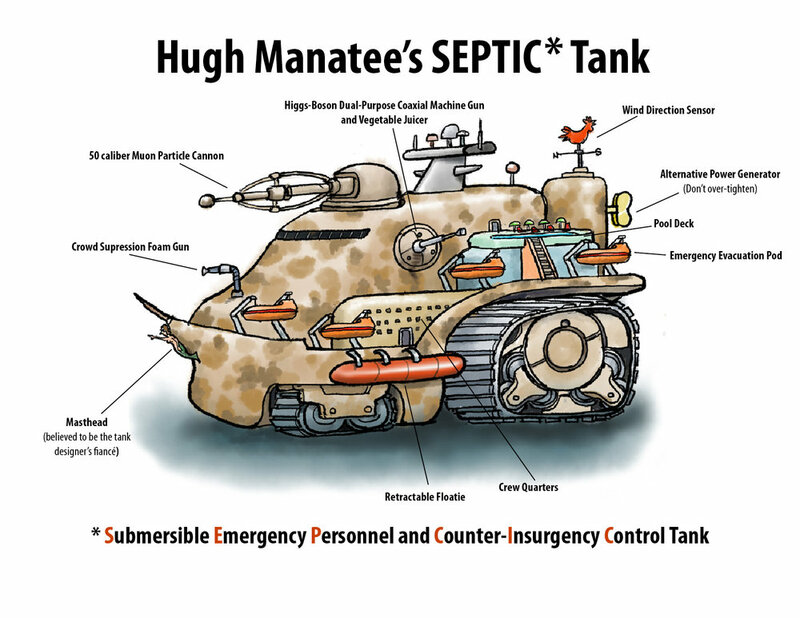 Hugh Manatee's Last Stand peeks into the future of warfare with this contraption from DARPA (the Defense Advanced Research Projects Agency). Without giving anything away, this vehicle plays a crucial role in the possible survival of Hugh, Iffy, and the gang. In addition to the features displayed above, the interior is amazingly spacious, with a comfortable eat-in-kitchen, en suites in the crew quarters, and a small rec room and spa on the Lido deck. These are your tax dollars at work!! As the author of a satirical dystopian fantasy, Hugh Manatee’s Last Stand, people are constantly asking me, “Why aren’t there any zombies?” Actually, it was just one person, my neighbor Nathan, who swears he just narrowly escaped abduction by aliens from Drogon-6. But still, it’s a good question. Well, it’s high time someone finally had the guts to call out the Big Zombie lobby that’s taken control of our media, our economy, and clearly, our government. If no one else will do it, I will. It started innocently enough, with George Romero’s Night of the Living Dead, the breakout hit of 1968. You can’t blame a young, cash-strapped aspiring film-maker for convincing his buddies to stagger around the woods in their underwear and bed sheets with their hands outstretched, moaning and drooling. But almost 50 years later, it’s gotten way, WAY out of hand, Actually, hands. And feet. And severed heads. And other unpleasant body parts strewn across the countryside, like something Salvador Dali might have painted if he’d gone to medical school. The Walking Dead is in, let’s see, it’s 41st season? Haven’t they run out of ways to slash, burn, shoot, electrocute, stab, fry, garrote, guillotine, disembowel, impale, crush, and tickle walking corpses into extinction? And why do I keep seeing Norman Reedus on late night talk shows? Let’s examine zombie behavior—the lumbering walk, the putrefied but still functioning bodies, the insatiable lust for live human flesh, the terrible vocabulary. I haven’t studied the science, but I’ll bet there’s a large body of research indicating that this is completely unrealistic. It’s entirely possible that zombies are quite articulate, and can walk, run, even do triathlons. And their diet might be quite varied, including babies and young children, which oddly ARE NEVER SHOWN BEING EATEN! As a creator of hopeless apocalyptic fiction, I refuse to capitulate to this Zombie coup d’etat. Lobbyists from Big Zombie interest groups showed up at my office unannounced. They dangled their rotting, barely attached fists filled with cash in front of my face as an incentive to include their ghouls in my project, but I sent them packing. The semi-immortal beings in Hugh Manatee’s Last Stand, the half-atars, are congenial, enthusiastic, and energetic. Yes, they’re high-strung, and random body parts fly off at the worst possible moments. And it’s true that their behavior can be a little dicey, what with intermittent bouts of Turrets Syndrome, leprechaumania (fear of leprechauns), and unexpected disrobing. Odd? Sure. Malicious? Absolutely not. So if you see me in a Starbucks or Lowes, I'll save you the trouble of asking me why I don’t have zombies in Hugh Manatee’s Last Stand. I’m saving the country, and the world, from the encroaching zombie insurrection. You can't get the full flavor of Hugh Manatee's Last Stand without understanding the topography where the action takes place. Here's a detailed map of the general area with important landmarks. FYI, Hogwarts and Kings Landing have nothing at all to do with this story, but including them offered an opportunity to snag some unwary web surfers. The references on the map won't make much sense right now, but keep this in map mind as you read on!